If you are curious about Hulu AND also want to have a six month HBO subscription at a very nice discount, you are in luck! Hulu has a special offer. You can add HBO to your Hulu subscription for $5 per month for six months in a row. HBO’s stand alone subscription (eg HBO Now) is $15 per month, so this is pretty good! Hulu subscriptions start at $8/month for the Limited Commercials plan. The offer works on any of the Hulu plans from the aforementioned $8/mo Limited Commercials all the way to the Live TV plan. Check the terms and conditions over there for the details and restrictions. 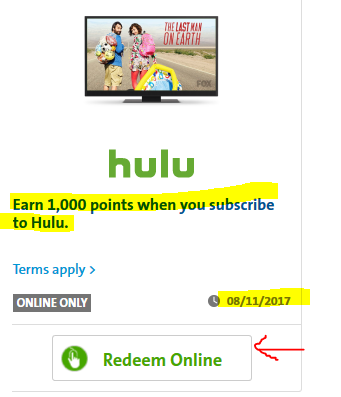 If you are participating in the Plenti rewards program, and you are interested in starting a new HULU subscription (you haven’t been a Hulu member the last 12 months), you will earn 1000 Plenti points AFTER you pay for your first month of Hulu service. The Free Trial does not count since your rewards earning is triggered by YOU paying for your first paid month. Hulu is $8 per month for the ads tier and $12 per month without ads. This offer expires 8/11/17. They also run some other offers after you subscribe to Hulu, eg watch a specific number or type of TV shows and get bonus Plenti points. If you don’t mind seeing TV Ads, the Hulu with Ads plan (they call it “Limited Commercials” in such a lovely Orwellian fashion) is having a new promotion, if you are a NEW CUSTOMER, you can get it for $6 per month for the first 12 months, instead of the usual $8 per month. After the first 12 months, you go to $8 per month (or whatever the price will be at that time). There is no parallel promotion for the Ad-Free plan which continues for $12 per month. My suspicion is that because they sell ads, they are trying to triangulate paying subscribers vs Page Views, and by lowering the monthly price, they can get more people to sign-up, so they’ll have more page views, and sell more ads. That’s why the no-ads plan is not discounted because they can’t offset ads vs subscription. Regardless, you can cancel any time. The 12 months are just the price guarantee, you don’t have to remain a paying customer for 12 months. The Plenti rewards program is having a new limited time promotion. If you were not a Hulu subscription during the last 12 months, and you start a new paying Hulu subscription, you will receive 1500 Plenti points after your first monthly charge. Hulu comes with a 7-day free trial, but you will earn the Plenti points after your first monthly payment. You must link your existing Plenti card to your Hulu account. After you do that, you can also take advantage of various 200 point promotions from Plenti-Hulu (eg watch 10 comedy episodes get 200 Plenti points). If you are part of the Plenti Rewards program [see our earlier write-up if you are not familiar with it], AND you haven’t been a Hulu subscriber in the last 12 months, AND you are interested in starting a Hulu subscription, they have a new promotion in your account. 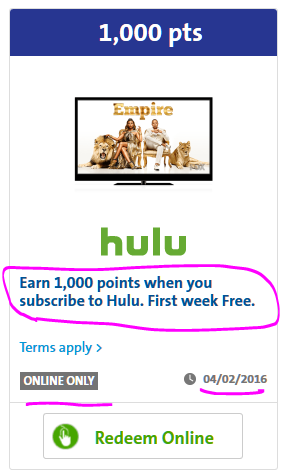 You earn 1000 Plenti Points ($10 equivalent) when you start a new Hulu subscription. If you have an American Express credit card, logon to your account and check your latest offers. One of them making the rounds is a Hulu offer. If you spend $10+ at Hulu, you will get $10 back as a statement credit. Even though the offer has a long expiration date, the sign-up period for the offer is shorter. So if you think there is a possibility you will use it, add it to your account as soon as you see it. Once added to your account, then you have the posted deadlines to take advantage of it. If that offer doesn’t work out for you, or you are not offered, there are a few Hulu offers making the round at the Plenti rewards program as well.